Disclaimer: Due to the complexity of the tax code and the individual nature of tax returns, the highlights of Stein Agee’s presentation mentioned in this article are not intended to replace the services of a qualified CPA or tax attorney. The EFA’s North Georgia Chapter kicked off its 2019 Professional Education series in February with a presentation from Stein Agee of AgeeFisherBarrett Certified Public Accountants and Business Advisors. Agee gave members of the EFA’s North Georgia Chapter a comprehensive overview of the Tax Cuts and Jobs Act of 2017 and explained how the sweeping changes to the tax code could affect their returns this year. The Jobs Act is the first major revision to the nation’s tax code since 1986, and although it’s designed to streamline filing for the majority of US residents, Agee said the new version is more complex than ever, even causing confusion among IRS agents. For taxpayers with more complicated returns, he recommends speaking with a CPA or tax attorney to ensure compliance with the new code and to take advantage of any breaks available. One of the biggest changes was to the tax brackets. Formerly, the top rate for married taxpayers filing jointly was 39.6 percent, which kicked in at $470,000 of taxable income. The new top rate of 37 percent comes in at $600,000 of taxable income. The standard deduction for married taxpayers filing jointly is now $24,000; the standard deduction for individual taxpayers is now $12,000. This means approximately 85 percent of all taxpayers won’t itemize. Pass-through entities, which include sole proprietorships and LLCs, are eligible for a 20 percent deduction on qualified business income unless taxable income exceeds $315,000 (married filing jointly) or $157,000 (single). Legal fees related to producing income are no longer deductible. Entertainment expenses are no longer deductible. The new deductions will sunset in 2025 unless Congress approves an extension. Although charitable giving, including donations of used clothing, is one of the most common deductions, many taxpayers don’t know how to assess the value of those donations. Agee uses a conservative formula: if he’s donating ten business shirts that cost an average of $50 each, he multiplies that amount by 25 percent. The ten shirts would be valued at $500, and the tax deduction would be $125. Another important tip for those deductions, Agee pointed out, is to keep all receipts for seven years because bank and credit card statements aren’t always sufficient evidence for the IRS. Most importantly, if a taxpayer receives notification the IRS is going to conduct an “examination” of their returns (commonly called an audit), Agee recommends hiring a certified public accountant or tax attorney first. In addition to discussing the tax code, Agee encouraged EFA members to obtain an employee identification number, which helps protect against identity theft while making it easier to set up business banking accounts. Although an EIN can still be stolen, it’s preferable to using a Social Security number. If EFA members have specific questions about the tax code or their returns, they’re welcome to contact Stein Agee at (404) 250-4570. This presentation was the first of the 2019 series of quarterly professional education seminars for members of the North Georgia EFA chapter, which launched in December 2018. Future seminars will cover social media marketing, building a successful freelance business, and other topics. Q: I got an EIN for my single-member LLC, mostly so that I don’t have to give out my SSN. However, on the W-9 form, it seems that the instructions say to use my SSN. Is it terrible if I use my EIN instead so that I’m putting myself at less risk? A: An EIN helps you protect your SSN and it’s easier to get a business bank account. You don’t have to register with the state as an LLC or DBA (Doing Business As) or other entity before applying for an EIN (though you should check your local regulations just in case), you can operate your business as a sole proprietorship. Q: Are there any tax benefits for a sole proprietor to use an EIN number instead of a Social Security number? A: You don’t get additional tax benefits when you register an EIN, but an EIN protects your personal identity. If you register as an LLC as well, it will further protect your identity and assets from liability (lawsuits), and it is an additional way to legitimize the growth of your business (if you intend to expand, take on contractors or employees, etc.). Agee recommends any sole proprietor earning more than $100,000 per year to register their business as an entity. Q: I run my business as a sole proprietorship and I file a Schedule C on my personal taxes as a pass-through entity. Is there any benefit to registering as a DBA? A: No, unless you want to operate your business as a separate entity (or if you run multiple businesses or LLCs under the same business name). Q: I am considering creating an LLC. How have the new tax laws impacted LLCs? A: LLCs are affected by the new tax laws in the same way as other pass-through entities. Make sure to research local laws that may affect your LLC. Q: Since the new tax breaks for individuals are not permanent (unlike corporate tax breaks), what can freelancers do to get the most out the current laws and protect themselves in the future? A: Get an EIN if you don’t already have one. Purchase an umbrella policy if you are worried about lawsuits. Someone suing you would most likely take what they can get from that policy and not go after you or your business. 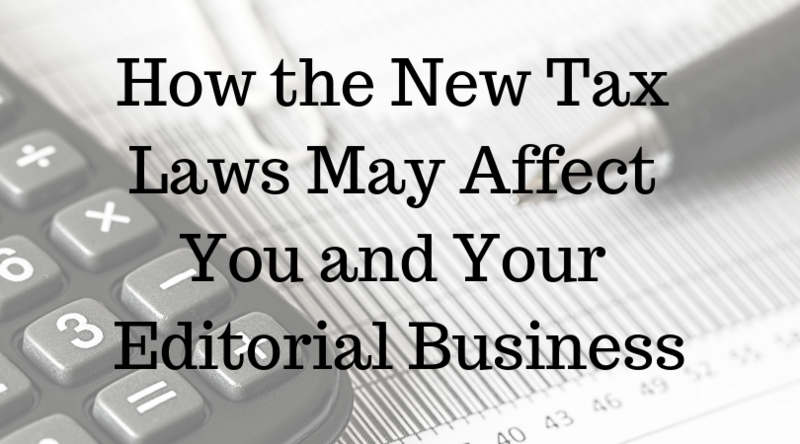 Q: Does a freelance editing business qualify for the new 20 percent tax break for “pass-through” businesses? My business is a sole proprietorship, not an LLC or other business type; I just file a Schedule C for my business expenses. Do I need to do anything special in order to obtain this break? A: Freelance editing businesses operated as sole proprietorships (unregistered with the state) do qualify for this tax break. Schedule C is all you need to file to get the 20 percent deduction. DISCLAIMER: These statements are based on generalized information about major tax changes, and are not tax advice. Please consult a tax professional for specific advice concerning how the changes in the tax code affect your business.